Helipopper is a Battle minigame found in Mario Party 7. Its name is a pun on "helicopter" and "pop". The camera turns around from the front to back of the first player's plane, then the screen splits in four to show the other players. 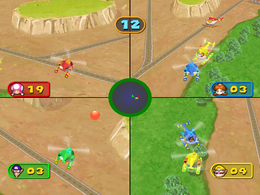 Players attempt to use a helicopter to fly around and pop balloons in the sky to earn points within the time limit. There are some balloon bunches in the area that are worth three points. Bullet Bills may also fly by. If a player gets hit by a Bullet Bill, he or she will be stunned for a moment. The player with the most points wins. This is one of the minigames that can appear in Decathlon Castle. Here, the player's objective is to pop as many balloons as possible to earn as much points as possible, up to a maximum of 1,000. The screen switches to the winner's plane, which is shown at a top-diagonal view. If there is more than one winner, the screen stays split with the winners' planes getting top-diagonal views. The losers' planes can be seen falling to the ground. If the minigame ends in a tie, all of the planes fall to the ground. Rules – "Fly the helicopters and pop as many balloons as possible." Advice – "Try to hit the balloon bunches. They are worth 3 points each." This page was last edited on March 27, 2019, at 01:03.